Atomic broadcast and leader election use the notion of quorum to guarantee a consistent view of the system. By default, ZooKeeper uses majority quorums, which means that every voting that happens in one of these protocols requires a majority to vote on. 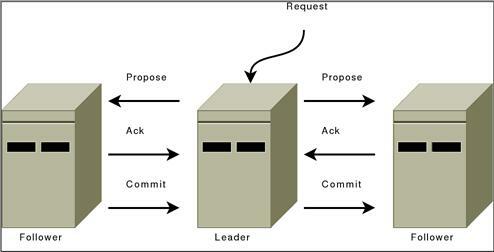 One example is acknowledging a leader proposal: the leader can only commit once it receives an acknowledgement from a quorum of servers. If we extract the properties that we really need from our use of majorities, we have that we only need to guarantee that groups of processes used to validate an operation by voting (e.g., acknowledging a leader proposal) pairwise intersect in at least one server. Using majorities guarantees such a property. However, there are other ways of constructing quorums different from majorities. For example, we can assign weights to the votes of servers, and say that the votes of some servers are more important. To obtain a quorum, we get enough votes so that the sum of weights of all votes is larger than half of the total sum of all weights. A different construction that uses weights and is useful in wide-area deployments (co-locations) is a hierarchical one. With this construction, we split the servers into disjoint groups and assign weights to processes. To form a quorum, we have to get a hold of enough servers from a majority of groups G, such that for each group g in G, the sum of votes from g is larger than half of the sum of weights in g. Interestingly, this construction enables smaller quorums. If we have, for example, 9 servers, we split them into 3 groups, and assign a weight of 1 to each server, then we are able to form quorums of size 4. Note that two subsets of processes composed each of a majority of servers from each of a majority of groups necessarily have a non-empty intersection. It is reasonable to expect that a majority of co-locations will have a majority of servers available with high probability. With ZooKeeper, we provide a user with the ability of configuring servers to use majority quorums, weights, or a hierarchy of groups. Zookeeper uses slf4j as an abstraction layer for logging. log4j in version 1.2 is chosen as the final logging implementation for now. For better embedding support, it is planned in the future to leave the decision of choosing the final logging implementation to the end user. Therefore, always use the slf4j api to write log statements in the code, but configure log4j for how to log at runtime. Note that slf4j has no FATAL level, former messages at FATAL level have been moved to ERROR level. For information on configuring log4j for ZooKeeper, see the Logging section of the ZooKeeper Administrator's Guide. DEBUG Level designates fine-grained informational events that are most useful to debug an application. However when creating parameterized messages are required, use formatting anchors. Loggers should be named after the class in which they are used.